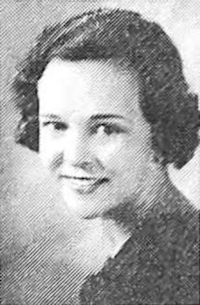 Obituary – Taylor, Marjory Fay (Barnett) « Perry High School Alumni Association, Inc.
Marjory F. Taylor, age 80, of Oklahoma City, passed away August 8, 1996. She was born October 31, 1915 in Wilson, Ok. to William Bernard and Alene Fay (Hamilton) Barnett. On July 29, 1938, she married Glen McMillen Taylor in Perry, Ok.
She graduated from Perry High School in 1933, attended Oklahoma A & M, and graduated from Central State University. She taught grades 1 through 8 in a one-room school house in 1936 and 1937. She became a Social Worker in 1966 and retired from the Department of Human Services in 1980. She was a member of Memorial Christian Church. She loved working in her flower garden, watching the birds, and collecting dolls. She is survived by her husband of 58 years, Glen M. Taylor; daughters, Betty F. Colvin and Mary S. Miller; grandchildren, Jeannie L. Fluke, Clayton Taylor Miller and Erin Brooke Miller, all of Okla. City; and brother, W.H. Barnett of Albuquerque, N.M.
Funeral services will be 2:00 p.m. Saturday, August 10, 1996 at Memorial Christian Church. Burial will be at Resurrection Memorial Cemetery. Memorials may be made to the Marjory Taylor Memorial Fund at the church.